Published by Orion Books and available from June 2nd 2011. 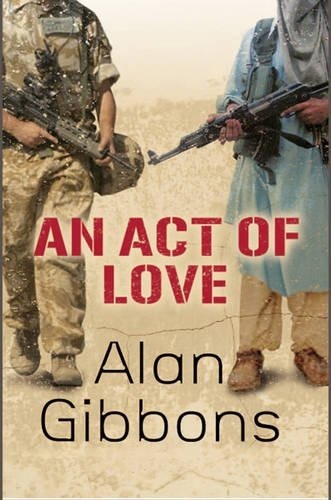 Description (Amazon):- An Act of Love by Alan Gibbons is about childhood friends Chris and Imran celebrate the Millennium as inseparable blood brothers, they are both seven years old. But by 2011 their lives have taken very different paths. One has joined the Army and served in Afghanistan, the other is a potential jihad recruit. They are no longer friends, and there are bitter wounds between them which remain unhealed. Will their childhood bond be strong enough to overcome an extremist plot? In a highly-charged, honest and life affirming story, told in flashback from both Chris and Imran’s viewpoint, Alan Gibbon’s cleverly explores the very real issue of terrorism that affects everyone today. Review:- This isn’t my normal genre but I was intrigued by this book and I was right to be intrigued, I was blown away by this book. It was amazing. This book is about two best friends called Chris and Imran, whom live next door to each other. Two different backgrounds and two different religions. You follow the next ten years of their lives. They start off staying in the same neighbourhood, they are best friends and sharing their lives until they grow up. Then racial issues, different views and world events have them growing apart and living many miles away. Chris becomes a British soldier and Chris joins a group of radical Muslims. Chris let’s his friendship with Imran fall away when he gets older as his life, friends and circumstances change. He goes into the army and the part about the Helmund Province in Afghanistan was a very interesting read. This made me realise I know very little about the war in Afghanistan and what effects it has on people. The changes between the two boys, whom used to be inseparable is heartbreaking to read. You can see how events can spiral out of control. This book made me realise how lucky I was and how lucky my family are not to be directly involved or effected by war. And left me wanting to know more about it. I would highly recommend this book to everyone, adults and teenagers alike. It is an amazing story about friendship and shows both sides of the war on terror and the effects it has. I found this book very emotional and thought provoking. A real eye opener. I would love to know what you think when you read it? Disclaimer:- I was sent this book by Orion to review, but the thoughts and words in the review are my own.